Our reporting this year on the American Society of Civil Engineers (ASCE) and their propaganda was a contribution to the public debate I am particularly proud of. What started out as frustration with my fellow bloggers -- as well as members of the traditional media -- over the mindless way they parrot the findings of ASCE, turned into something that landed us on the pages of Newsweek and the Washington Post, not to mention garnered us lots of support from engineers working in the profession. Even today, this entire event has a surreal feeling. ASCE releases a report that projects -- in a completely bogus and inflated way -- all of these damages that will be suffered if we don't spend more money maintaining our highways. As if there weren't enough to critique with just that, the report then calls on the government to spend many multiples of the inflated "damages" to avoid all this suffering. None of this was difficult to discern for anyone willing to flip beyond the press release. Despite this ridiculousness, the blogger world along with the traditional media outlets ran with ASCE's propaganda. The unwritten premise of the report -- that spending money on highways is ALWAYS a positive investment -- is so strong that nobody even bothered to question the numbers. There was only one word to me that described this reaction. Cult; a group or sect bound together by veneration of the same thing, person, ideal, etc.. When ASCE "revised" their report, I sensed we had exposed a truth they hadn't even questioned themselves. When ASCE president Kathy Caldwell suggested to Neal Peirce of the Washington Post that Strong Towns made "misstatements" in how we characterized the "purpose of the study" (not any of our facts), I knew we had changed the debate. In their report, ASCE indicated that there would be three subsequent studies released in the coming months on other parts of America's failing infrastructure systems. I anticipate that, should they proceed with releasing those publications, they will be subject to some actual scrutiny from more than just Strong Towns. Yesterday we wrote about the ridiculous piece of propaganda issued by the American Society of Civil Engineers and dutifully circulated by the media. The report was designed to paint a negative picture of America's future if we did not pony up trillions for engineers to build and maintain infrastructure. The central argument was that continued decline of our infrastructure systems would cost us $1 trillion over the next decade. To avoid this calamity, according to ASCE, would cost us a mere $2.2 trillion. This is modern engineer-logic, where spending $2.2 trillion to save $1 trillion is just plain common sense. Ostensibly they want to be taken seriously. Let's focus on the revised GDP number of $2.6 trillion by 2040. Last week we talked about budget projections in our Monday piece, Downgraded. We pointed out how the Federal government is using overly-optimistic projections of GDP growth and how just slight changes downward in those projections would mean trillions in lost GDP. 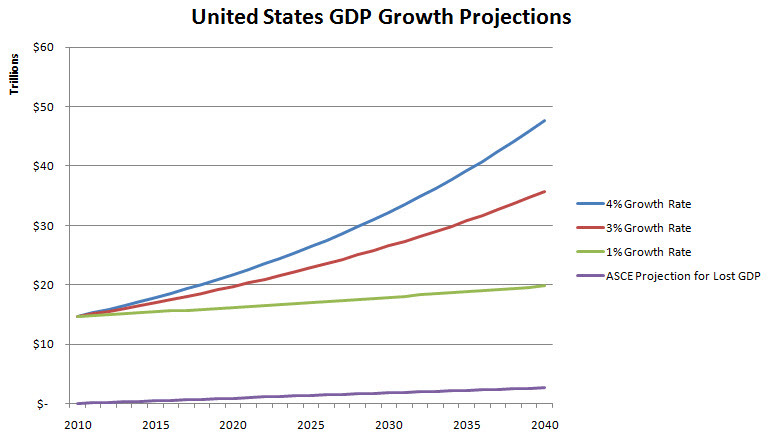 In fact, a minor drop in the growth rate from 4% to 3% would cut $2 trillion out of the GDP by 2020. This illuminates the absurdity. Even in the scariest scenario envisioned by ASCE's report, GDP loss amounts to a fraction of the estimation error between the different assumed rates of growth. When you get to 2040, the $2.6 trillion in cumulative loss pales in comparison to missing the overall growth rate in the projection by just 1%. This is statistic silliness. This also shows how ridiculous 30-year projections are. Do we really have a clue as to what our economy is going to look like in 30 years? Yesterday I looked back to 1981 in an attempt to point out how much change has taken place in the last 30 years. The hubris involved in making a projection like this, with the precision they offer, is laughable. Just for the mental exercise, let's take ASCE at their word and assume we lose $2.6 trillion cumulatively in GDP. Since we tax at roughly 20% of GDP, that would mean the U.S. Treasury would lose out on $540 billion in revenue over the next 30 years. Contrast that with the $6.6 trillion they are suggesting we spend over that same period and you start to get a sense for how backward this logic is. When I said yesterday that this felt like a cult, this is what I meant. We have collectively believed for so long that spending on infrastructure is the key to prosperity that we don't even bother to check if it is. I don't think ASCE even checked their own numbers. They simply looked at the estimates for lost GDP, etc... and said, "That sounds pretty bad." Then they looked at their projection for how much money they and their allies wanted to shoot for in the appropriation and said, "That sounds right." They are all so brazen they didn't even bother to notice that the amount they wanted to see spent was more than the amount they claimed we would lose! Or did they notice but thought we would be too stupid to figure it out? If they did, it worked. I've searched all over Google news and can't find a single story or blog that did anything but parrot this report's findings. Just like in a cult, nobody questions this stuff. You'll note ASCE never took the annual transportation appropriation they were calling for and ran that dollar amount out to 2040. That would not have been good propaganda. ASCE's report is an embarrassment to the engineering profession. This revision merely adds insult to injury. ASCE claims we made "misstatements"
Neal Peirce chose to trumpet the misstatements made in the “Strong Towns” blog about American Society of Civil Engineer’s “failure to act” report instead of looking into the report’s intent himself [“Prioritizing the nation’s infrastructure investments,” Seattletimes.com, Aug. 20]. If he had, it would have been clear that the study’s purpose was to show the expected negative effects of America’s current level of investment in surface-transportation systems, not prescribe ways for infrastructure dollars to be spent. My critique of the ASCE report was that it was a ridiculous piece of propaganda that (1) intentionally distorted the numbers by projecting the "negative effects" cumulatively over 30 years and the needed "investments" in single year increments, and by doing so it (2) actually didn't recognize the fact that the "investments" had a far greater cost than the "negative effects" and thus (3) failed to provide any relevant information to decision-makers and policy advocates. My critique was also of the polticians, media and bloggers who blindly parroted the ASCE narrative in a call for more spending. While it is true that the ASCE report does not, as Caldwell indicated, "prescribe ways for infrastructure dollars to be spent" in that it does not recommend specific projects or appropriation methods, it pretty clearly follows the bad-things-will-happen-unless-we-spend-more-money approach. I urge everyone here to read the press release from ASCE and the report and see for themselves. In fact, here are the headings from the different sections of the press release. Read these and ask yourself if ASCE is playing the role of truth-seeker or propagandist. Caldwell and ASCE are adding insult to injury if they are going to try and say now that their intent was solely to point out the problem but had no suggestion as to what the policy response should be. Clearly, the response for a country that "fails to fund" is to fund, is it not? What are they trying to suggest by saying that only "modest investments" are needed to forestall "suffering" and a "lower standard of living"? Why include the "modest investments" at all if their only intention was to point out the problem? The reality is, we've been pointing out this same problem for years: The United States has more infrastructure than we have the money to maintain. 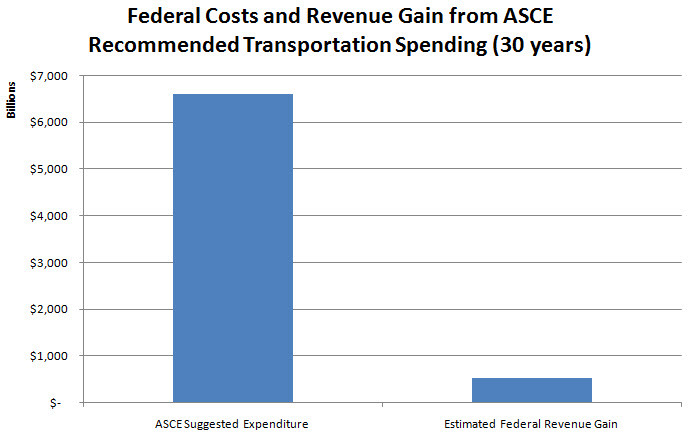 And as ASCE's report so vividly demonstrates, the public's return-on-investment for this system is horrendous. What we have built is simply not productive enough -- it does not generate enough prosperity -- to sustain itself. Where we break from the propaganda machine at ASCE is in pointing out that "modest investments" are needed to keep this Ponzi scheme going. Overlooking the fact that the cost of the so-called "modest investments" exceed the cost of the estimated "suffering", Strong Towns is not calling for "modest investments", implied or otherwise. We're calling for an entirely different approach. Many of our members are suffering from the impacts of the current recession, which impacts ASCE as an organization. Consequently, our members rightfully expect ASCE to make similar tough financial, operating, and management decisions. We must systematically review every element of the Society, going beyond the work of the Program Committee, which looks at only 10% of our overall budget. A benefit-versus-cost analysis must be performed to identify areas of the Society that are underperforming or unproductive and, therefore, should be corrected or suspended. We need to trim the trees and weed the garden, without destroying the landscape. Hopefully Caldwell will apply her organizational philosophy to the conclusions contained in the next ASCE report instead of promoting -- implied or otherwise -- a mindless continuation of the status quo.